In the waning days of October, The Boing Heard Round the World took center stage in the Harryhausen theater at this year’s World Animation Celebration, held on the Sony Animation lot in Culver City. On hand for a lively and informative panel discussion, moderated by Lee Crowe, four panelists, passionate about UPA and our documentary feature, exchanged stories about the creative output of UPA, as well as their individual feelings about why this documentary about UPA is so important. The panel consisted of G. Allen Black, Art Director of the documentary, and a Graphic Designer specializing in intellectual properties, Bob Kurtz, the founder of Kurtz & Friends, and a multi-award winning director, producer, artist, and designer, Geefwee Boedoe, an Oscar nominated animator, and a multi-award wining children’s book writer/illustrator, and Tee Bosustow, Producer/Director of the UPA documentary, and a multi-award winning documentary filmmaker. Preceding the discussion, a brief video was screened, with an intro by animator/historian, Tom Sito, plus, clips from four top UPA shorts; Tell Tale Heart, Rooty Toot Toot, Gerald McBoing Boing, and Barefaced Flatfoot, an early Mr. Magoo short. The audience was captivated by the UPA clips and the enthusiasm of the panelists, each with their own take on the legendary animation studio. The Animation Celebration featured two full days of animated films, industry panels, guest speakers, and world-class professional judges to promote global animation and newly emerging artists. This was the second year of the revitalized World Animation Celebration, which totally dominated the Animation Festival scene of LA in the 90s, long before any of the others came along, so us old timers were thrilled to see them back with such a magnificent weekend program, which was somehow both exciting and relaxing at the same time. If you missed this weekend, they’ll be back next year better than ever, but at this same great spot on the Sony Animation lot. The first image shows; G. Allen Black, Bob Kurtz, Geefwee Boedoe, and Tee Bosustow, during their panel discussion. 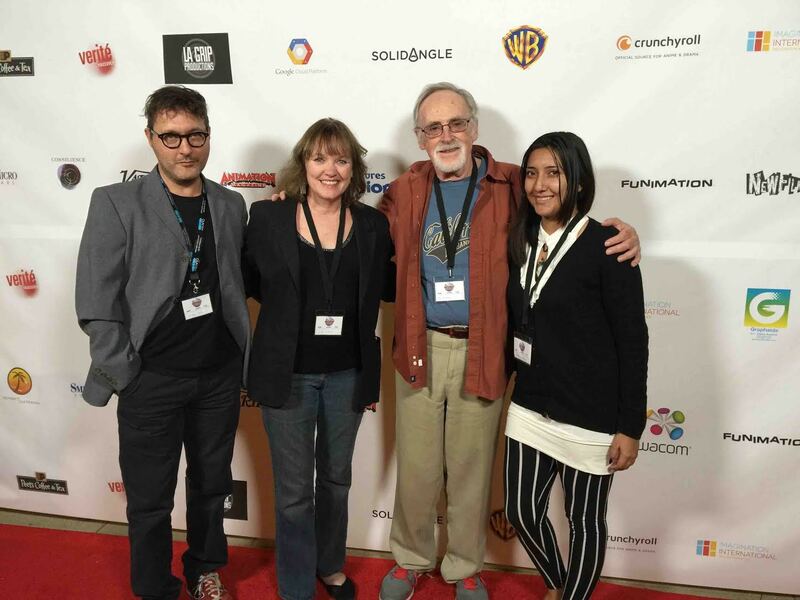 The second image is; Art Director, G. Allen Black, Moderator, Lee Crowe, Producer/Director, Tee Bosustow, and Lead Production Assistant, Gwendolyn Arreola, getting photographed on the Red Carpet.